The arts are a powerful presence at UMBC. When I walk through the arts buildings at the end of a long day, I see and hear artists working everywhere I go. I see dancers and choreographers working in the dance studio, videographers editing their work, photographers mounting their works in the Hallway Gallery. I hear singers practicing and percussion music. I meet actors, who are practicing their parts outside a rehearsal studio. Many of these dynamic and talented artists are Linehan Artist Scholars. I feel very grateful and excited that Linehan Artist Scholars can receive the kind of academic and financial support talented young artists need to pursue a career in the arts. Doug Hamby is a choreographer who specializes in works created in collaboration with dancers, composers, visual artists and engineers. Before coming to UMBC he performed in several New York dance companies including the Martha Graham Dance Company and Doug Hamby Dance. 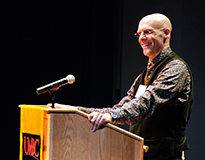 He is the co-artistic director of Baltimore Dance Project, a professional dance company in residence at UMBC. Hamby’s work has been presented in New York City at Lincoln Center Out-of-Doors, Riverside Dance Festival, New York International Fringe Festival and in Brooklyn’s Prospect Park. His work has also been seen at Fringe Festivals in Philadelphia, Edinburgh, Scotland and Vancouver, British Columbia, as well as in Alaska. He has received choreography awards from the National Endowment for the Arts, Maryland State Arts Council, New York State Council for the Arts, Arts Council of Montgomery County, and the Baltimore Mayor’s Advisory Committee on Arts and Culture. He has appeared on national television as a giant slice of American Cheese.